Click the button below to add the Carbon Fibre undercarriage for 100cc or above to your wish list. 100E2B A 225mm C 275mm EXTRA260　etc. 100Y　 A 200mm C 250mm YAK　etc. 100E3 A 195mm C 260mm Extra330 etc. 150E2 A 270mm C 260mm EXTRA260　etc. 150Y　 A 225mm C 310mm YAK　etc. 150E3 A 230mm C 265mm Extra330 etc. 250Y A 260mm C 400mm YAK etc. 250E2 A 340mm C 400mm Extra260 etc. 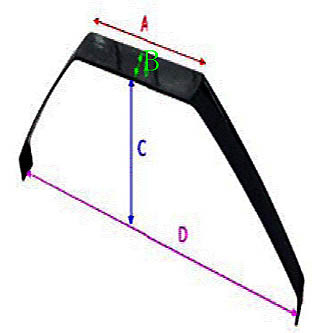 We work together with Carbon Fibre factory and have the most complete range in the market. Shipment takes approx. 8 calendar days. Delivery to street address only, not to P.O box.